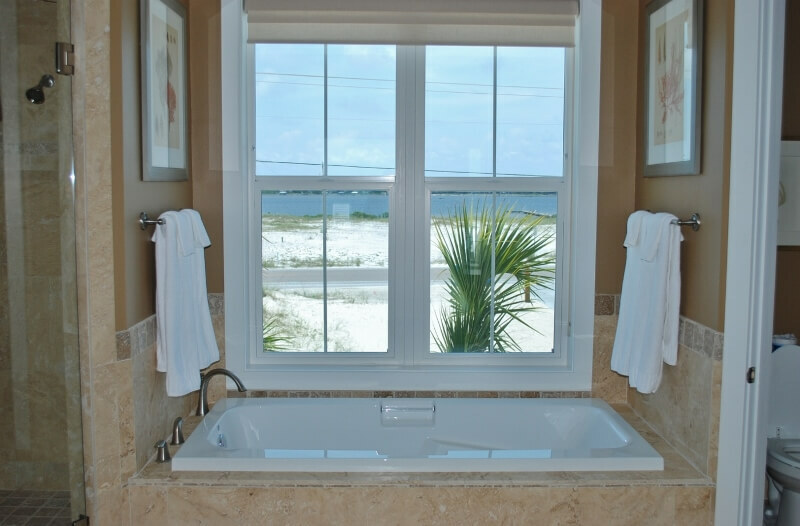 Morning Call is a gorgeous luxury beachfront home, directly on 100' of beautiful white sand Gulf beach. It has 11 bedrooms, 11 full baths, an elevator and a private pool. 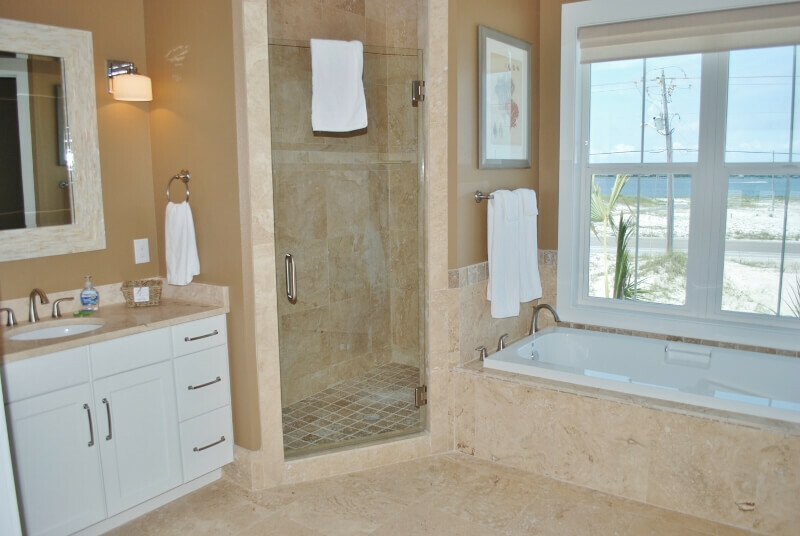 You'll find luxury touches throughout with beautiful travertine floors and fine furnishings and finishes. 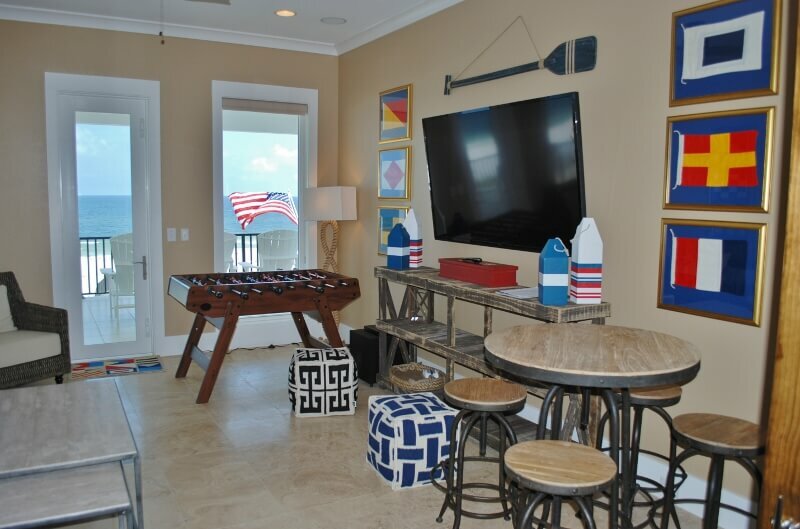 You may have seen Morning Call on the HGTV series Beach Flip. It housed the design teams in luxury surroundings while they renovated 4 small nearby homes. This is a perfect home for a large gathering. There is a very large living area complete with big dining area that provides plenty of room for everyone to dine together. 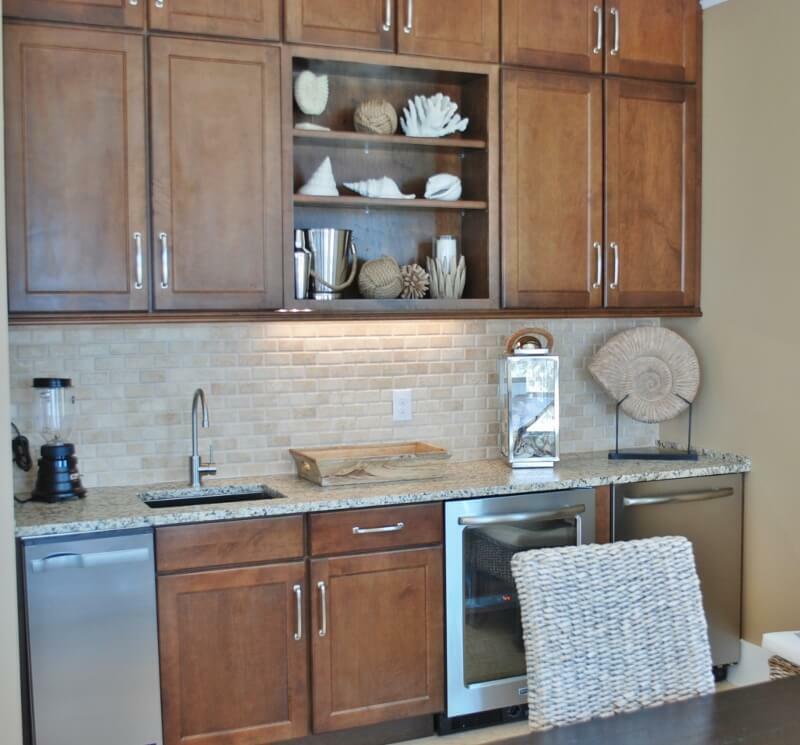 It has a beautiful granite and stainless kitchen complete with two refrigerators, two stoves and 3 dishwashers. There are also eleven spacious bedrooms, each with a bath, and an elevator for the home. 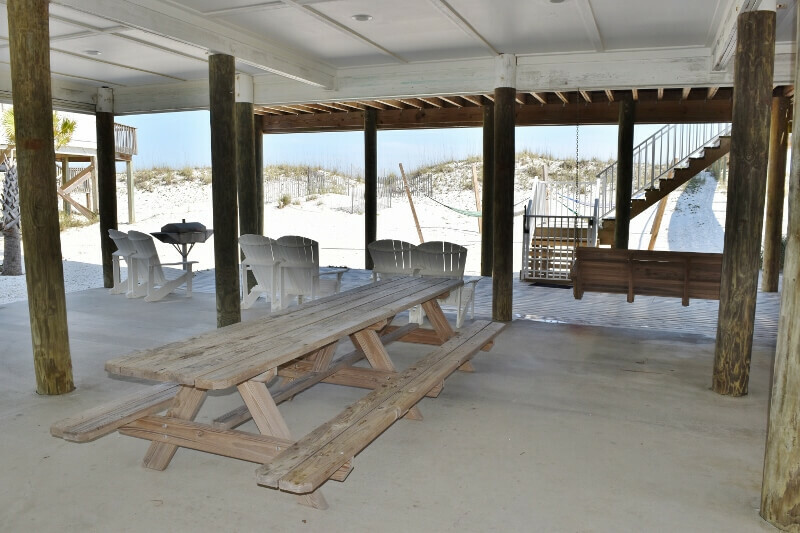 There is a large covered beach side porch with a heated pool and lounge chairs, outdoor dining space and more. You'll also find a large area under the house with swings, hammocks, a grilling area and room to relax in the shade (yes, you may find you want shade if you didn't wear enough sunscreen!). The first floor has large open living room with graciously appointed kitchen, dining area, wet bar, breakfast bar with stools and more. 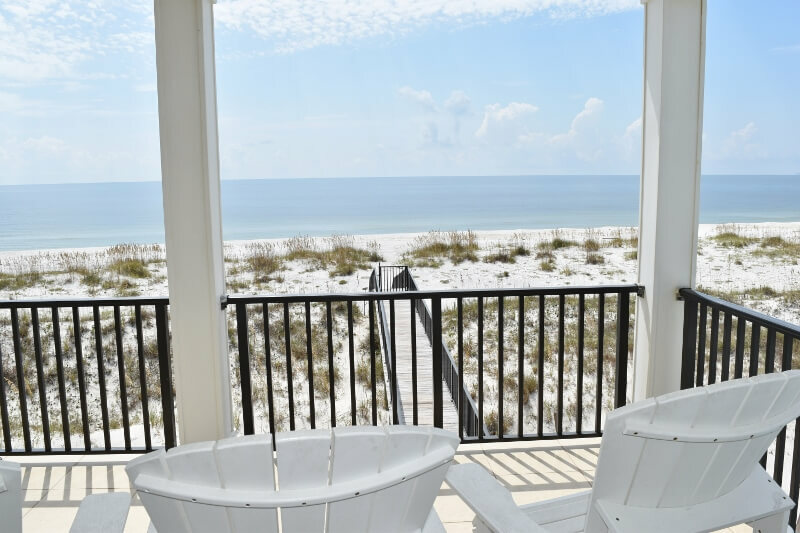 You'll also find four bedrooms on this floor including a large king master with a porch by the pool, a king with a Gulf-front porch and a handicap accessible bath, a queen with Little Lagoon views, and a lagoon view bedroom with a pair of queens. 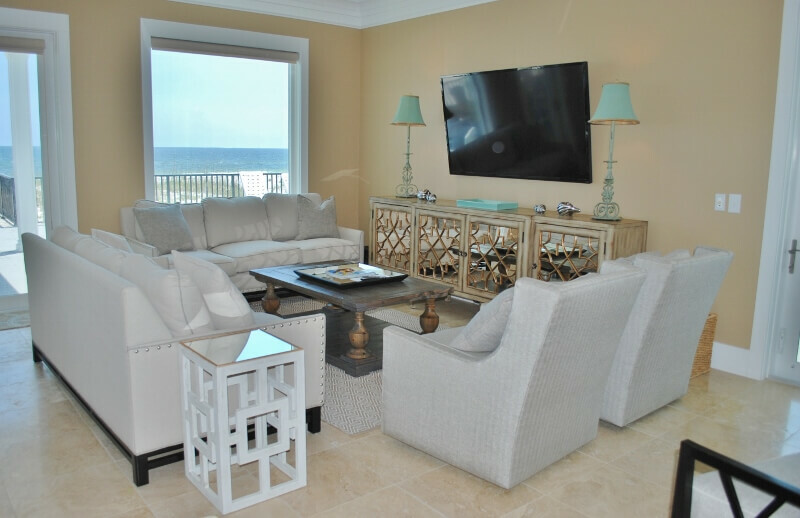 The living room opens to a Gulffront porch with a pool, and a dune walkover to the beach. 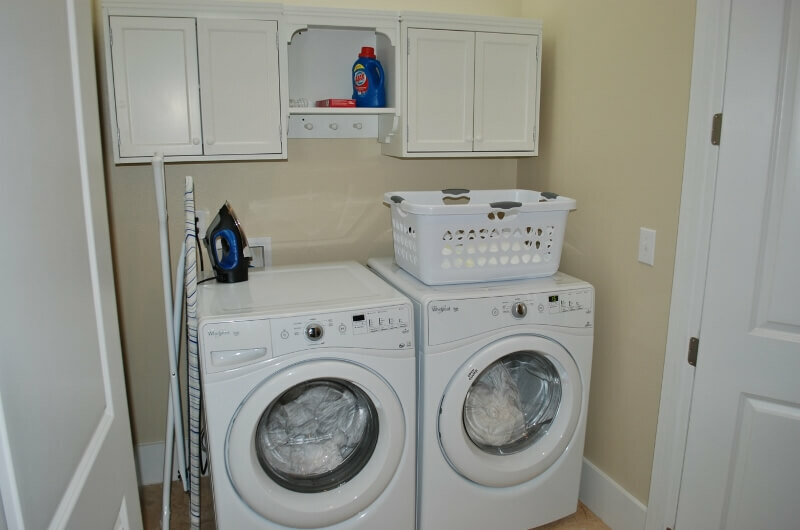 You'll also find a large laundry room and pantry on this level. The second floor has a total of seven bedrooms, each with its own bath. 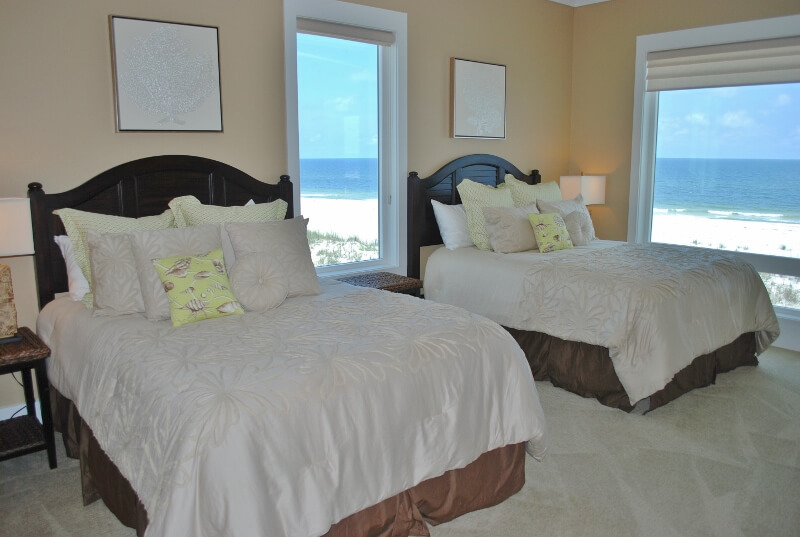 There are 3 king bedrooms, each with a private bath, two of them opening to a private Gulffront porch. 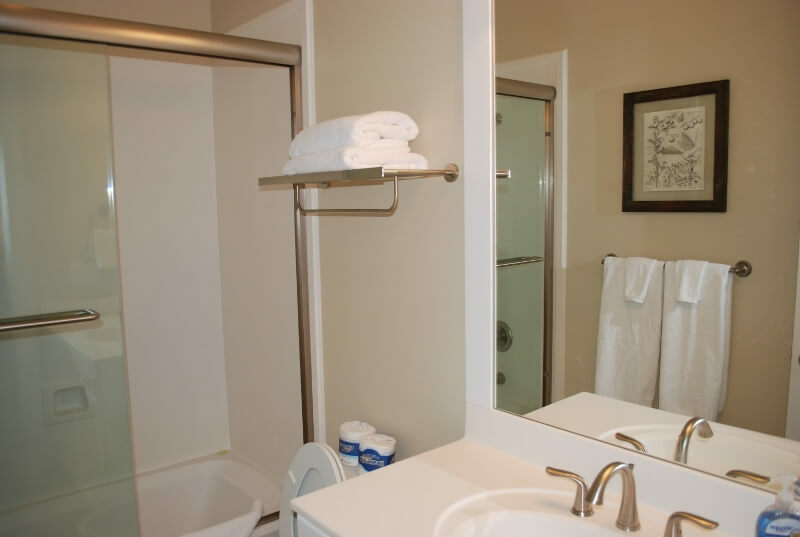 There are three bedrooms that each have two queen beds and a private bath. 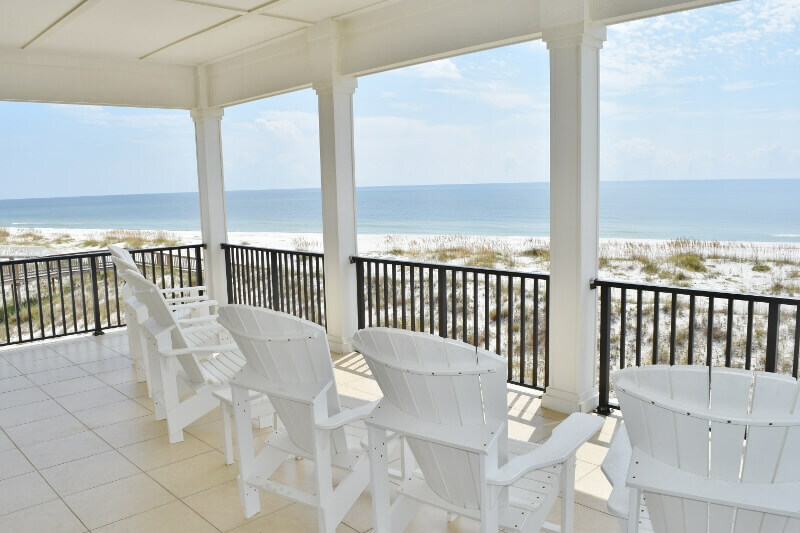 Two of those open to the big beachfront porch that is also accessible from the upstairs family room. 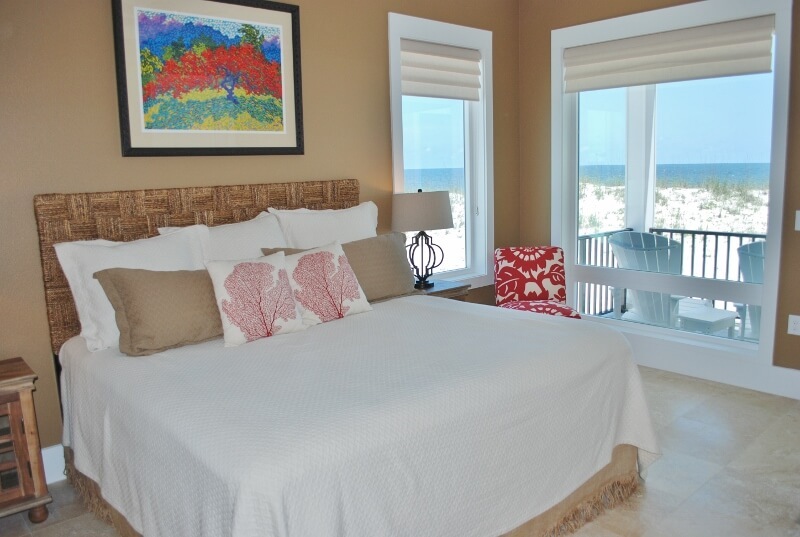 The 7th bedroom on this floor is a queen bedroom with lagoon views. Upstairs you'll also find a family room with another large TV, movies, books, a wet bar and more. 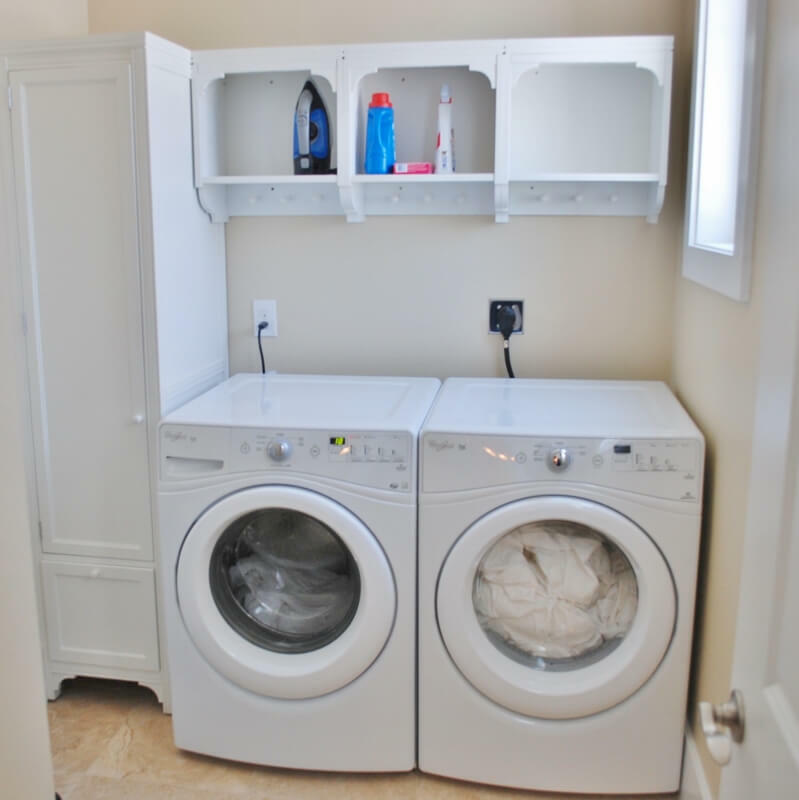 We have a second laundry, and a powder room here as well. 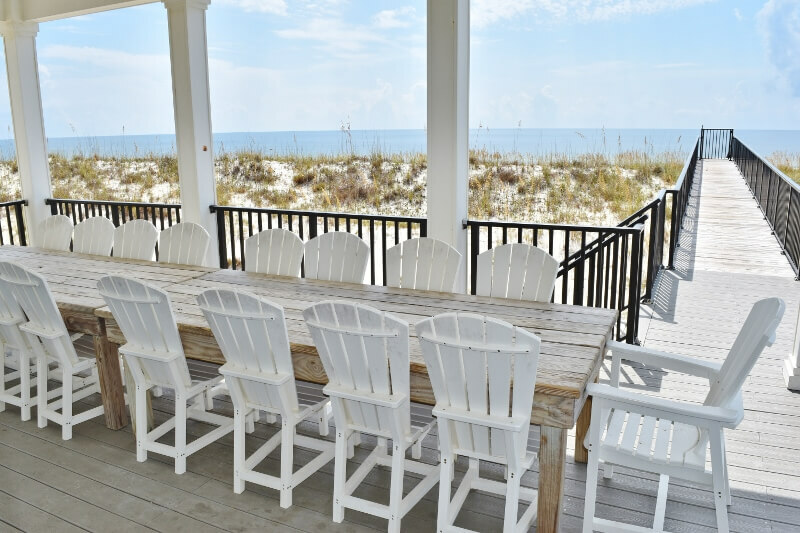 We hope you'll give a try for your next gathering at the beach. A little rain and some chilly wind on spring break made the beach a little too cold to enjoy, but this house with the pool allowed for a great week anyway. Very nice place! Morning Call is an excellent facility for our group...plenty of bedrooms...each with its own bath. Location is big crowds on the beach. Only problem was lack of trustworthy was spotty at best. The elevator was a Godsend...especially for moving in and out. Thanks for rebooking with us again! The location is AWAY from the big crowds. This year we did have very spotty internet service that week due to Mediacom work in the area but that appears to be resolved. Our family had a great vacation staying at this house. It was everything we wanted and needed! Morning Call is a beautiful, very functional beach house!!! This was our second stay in the last 4 years and we have reserved it for a week in the summer of 2019. Location is great because there are no high-rise condos, which means the beach has almost no people most of the time. This house handled our group of 25 perfectly. our rental was top notch. would recommend it to others. Everything we need was there for our use. Very clean. Almost everything was perfect. Accommodations are wonderful. Unbeknownst to IRMA our family already had plans for this weekend! What a fantastic place! Beautiful, clean, well stocked, plenty of room for every one. No complaints from this family of 20! part of whom were from Florida (we were one step ahead of you Irma). We loved this place, it was by far the best vacation rental we have had to date. We would choose this beach house every time but sadly it is not available for our usual vacation dates in the summer. Beautiful place, everything we could need was there, nice quiet beautiful beach (plus we had a bonus, we got to what baby turtles hatch and make their way to the ocean). This place was every thing it promised, Highly Recommend!!!!!!!!!! There was lot's to do in Gulf Shores but we never left the house and beach. we were very excited and could hardly wait to get there. The stay was amazing with all the space and extras that Morning Call has. the place was very clean and beautiful. Another great week at the beach. Morning Call is just right for our family (23/28 each year). The location and the facility itself is ideal and serves our family well. This was our third year to be at Morning Call and we have next year reserved. We had an awesome vacation at Morning Call, property was maintained & clean. Kitchen was great for our large family. I do feel like we could have had more paper products upon arrival, and more waste baskets. The guys had a great fishing trip & the beach was clean & private. The pool was nice to have but a little small for our 28 people. I would come back in a heartbeat. Owners were helpful & easy to get in touch with, if needed. GREAT VACATION!!!! Excellent! House is built and stocked for large family reunions. Issues were addressed quickly by the rental staff. Thanks! 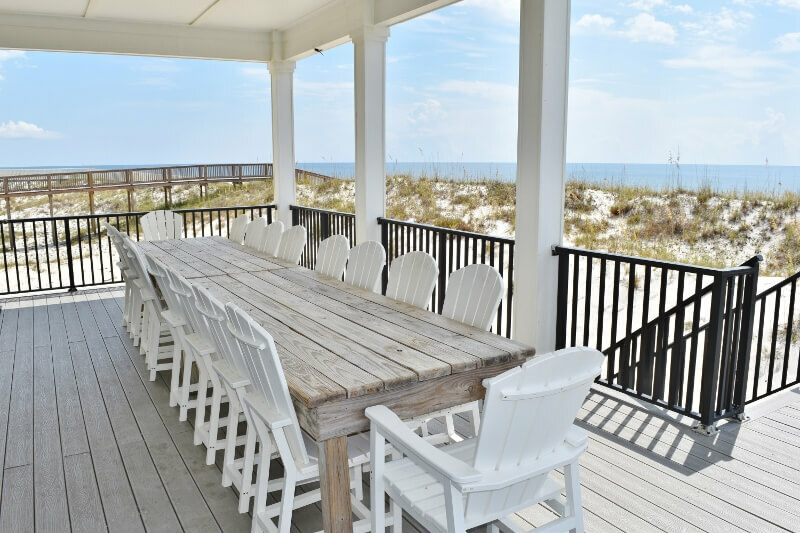 Perfect weather, great beach access, outstanding home with supburb furnishings and a kitchen with more than enough equipment to support the 22 people in the family reunion vacation. We enjoyed the Home and our stay. Our High School team of 21 athletes accompanied by 5 adults thoroughly enjoyed our stay at the Morning Call. The clean house with a very open main-floor provided a great experience for team bonding and relaxation. The amenities were great and the rooms were spacious with very comfortable beds! 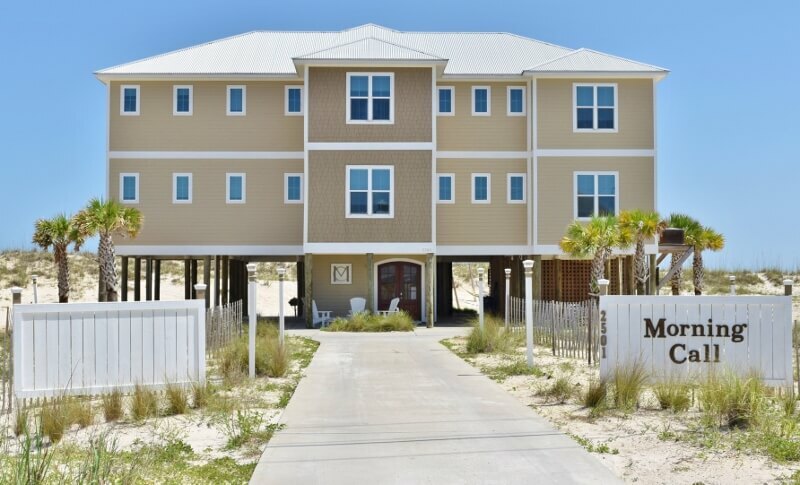 We have rented from other companies in the past, for many years in Gulf Shores, and have never had this experience. Not only was the house spectacular, in the condition it was advertised, but the response time from GSVR for a few maintenance issues was superb. Definitely a 5 star rating in our book! We are a big extended family, but found that Morning Call was absolutely perfect for all of us. 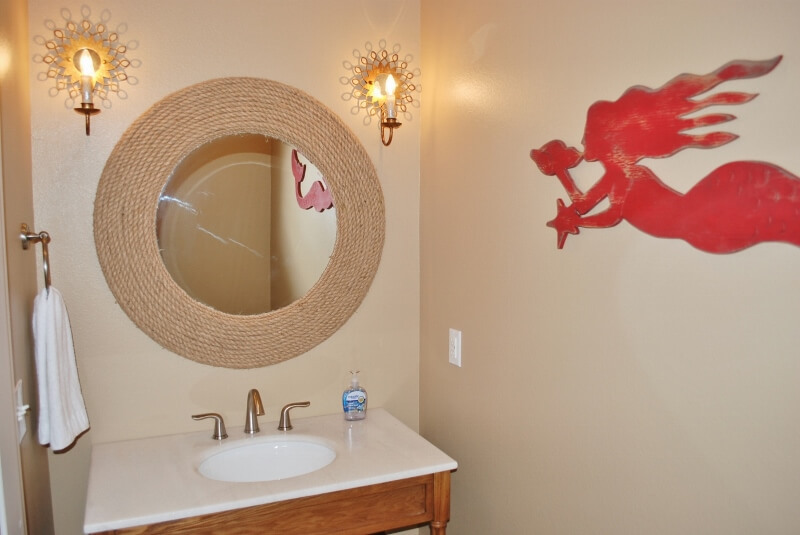 The house is very well maintained and well stocked with all the necessities. I highly recommend Morning Call for any large group looking for a great place to stay. We had 26 family members from all over the country from age 84 down to 18 months. We all had such a wonderful time! Morning Call is a beautiful house. There was so much room and it was so well stocked. Susan & Geoff were so helpful, esp getting their pool man out so quickly when we had a problem. House is far enough away from crowded area, but not too far for shopping or dining. Only problem was that the week went too fast! Our supper club gathered for our annual trip at Morning Call. Most said it was the best house we have rented in all 19 years of our club. Very clean. Responsive maintenance staff to a toilet issue. Ample parking. Comfortable beds. The only drawback was patchy internet service. Our group of almost 20 just spent another great week at Morning Call. This was our second year at this wonderful beach house as it is the perfect set up for our large group that includes two elderly parents in wheelchairs as well as several children under 3 years of age. Because our group is so large, we cook in most evenings and the kitchen is well stocked and plenty of seating area. It is also wonderful to have the heated pool for our October week. Our group of 15 spent a long weekend relaxing and working on various quilting projects. We were easily able to accommodate 7-8 sewing machines, and had plenty of seating for those doing handwork. 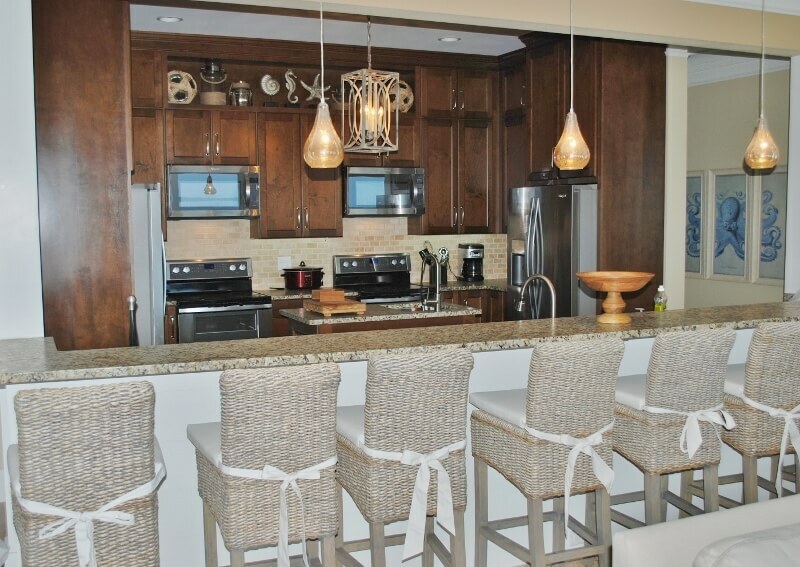 The kitchen facilities were well planned and allowed several people to work together with ease. Bedrooms and adjoining baths were spacious. The beach was easily accessible, and the views from the balconies were stunning. It's hard to find a home with 10+ bedrooms that isn't a duplex. We loved the single living room with windows facing the ocean. It had multiple seating groupings so we could be together but still be doing different things. The pool on the same level as the living room was also a nice layout change. Two ice makers and a bar area made for happy adults. We've already booked for next year! Morning Call a great place to stay.Processes for reservations and information flow work well. Several checks by email during our week to see if there where any needs. -Two bedroom bed linens had not been changed and we had to wash/dry them prior to use on Saturday night. -At least two bathrooms had not been cleaned and wash cloths and towel had not been picked up and cleaned. -Door knobs on bedroom at head of stairs on second floor loose and came off during use. -No sand in the pool sign has broken loose from its mount and is stuck between the water pipes bring the water to the shower. -Also, the grounds around the outside had not been picked up of bottles/cups/papers/etc. One of the staff came by to find something that the previous weeks guest thought they had lost and we discussed the bed linen, wash clothes and towels with her. She responded immediately with fresh towels. Hope this will assist with maintaining the property and the service that you give so well. Morning Call was perfect for our family of 22. There is space for everyone to get away if necessary and for together time. One of us needed the elevator and handicapped bathroom. The balconies are wonderful and all enjoyed the pool. A good location away from condos and beautiful beach!! Due to a new great-grandchild, we ended up with only 20 of us, 9 G-Grndchldrn and 11 adults. We hope to have more family next year. We had an absolutely wonderful time. The house is perfect for a large group (great room/kitchen was fantastic); we loved the pool and the beach and everything. Best house and beach we've had in the 12 years we have be renting large homes for our group of 26!! Excellent rental experience. I appreciated the frequent emails as well as the phone app. The property was amazing. Only the weather kept it from being a perfect trip. We had a great time. There was enough room that we all left still speaking to each other. Would do it again in a heart beat. This was our 3rd time at this property. We keep coming back for more. Very roomy and and beautiful. It felt like we had the entire beach to ourselves. had a great time in a great facility, everyone wants to return to Morning Call. Overall the house had everything you could possibly imagine and more (except a pizza cutter). The location was a bit further down than what we are used to, but the beach was like having your own personal beach. It was not crowded at all and was perfect for our size group. Morning Call was the perfect place for our annual family beach trip! So much room! Every amenity we could ever have asked for and more. The kitchen was beyond stocked. Our family loves to cook (and eat!!) together. This kitchen had everything!! The private pool right outside the door was heaven for the little ones. The hammocks under the house were a favorite for afternoon naps. And the best part, at the end of fun-filled days, everyone could retire to their own private space for the ultimate in relaxation!!! The owners/managers went above and beyond. Making everything so simple. Email reminders and instructions, the mobile app was excellent for quick check-out. They have thought of everything!!! My only request, and it isn't just this house, I wish there were wall hooks everywhere. We needed places to hang wet towels, swimsuits, beach bags, etc. Am I asking too much?! Ha! 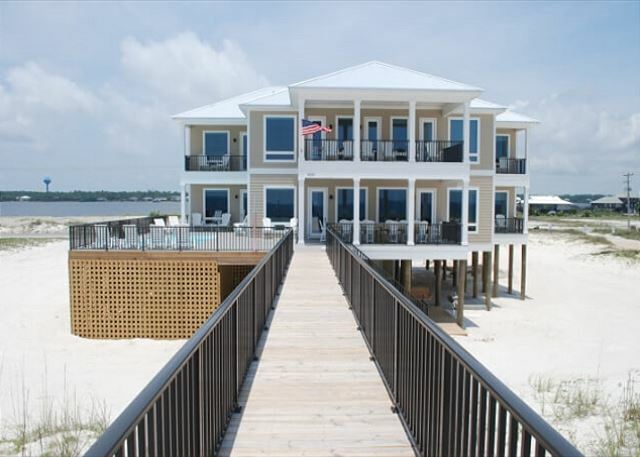 We stayed at Beach Blessings last summer, and this house is so similar just bigger!! Thanks Susan and Geoff!!!! Looking forward to next time! 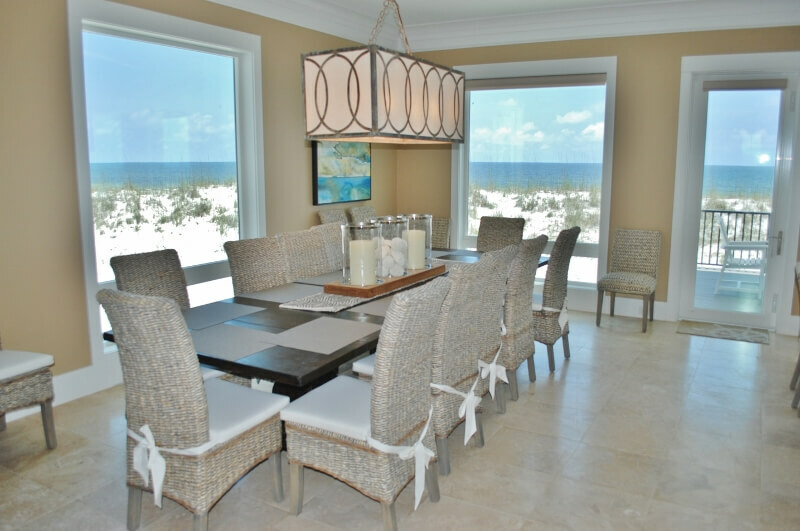 Beautiful setting on the gulf , beautiful vacation home , impeccably designed and well managed . This was the absolute perfect spot for a family beach vacation! We had a family of 30 (21 adults 9 kids) and we had plenty of room and space for all! The main follow dining / entertaining area was more than enough for us to all congregate regularly. Sound is piped throughout including on the pool / deck areas. We are already looking at next year. Susan and Geoff were wonderful to deal with. Thanks again "Morning Call", You Rock! recommend this house to our family and friends. The house was in very clean condition on arrival. -The non stick skillets are not "non stick"
Everything was great except the air in the master bedroom and it was very hot.I have breathing problems and it was very hard on us. Wonderful Family Reunion at the Beach! This was our second year to be together as a family at Morning Call. It is a perfect house for the 19 of us to gather. The facilities and amenities are so well thought out. We cooked every meal for seven days in this kitchen that is so well laid out. Loved the pool and the beach access which is so private. Our only complaint was the internet connection. A new modem was installed midway through the week after which we all had a difficult time staying online. We were told that it was because we were so many people but that was what we were paying for- accommodations for a very large group. Also one of the microwaves and one of the dishwashers didn't work until they were both replaced the last day we were there. Had a great time house was well maintained and stocked. 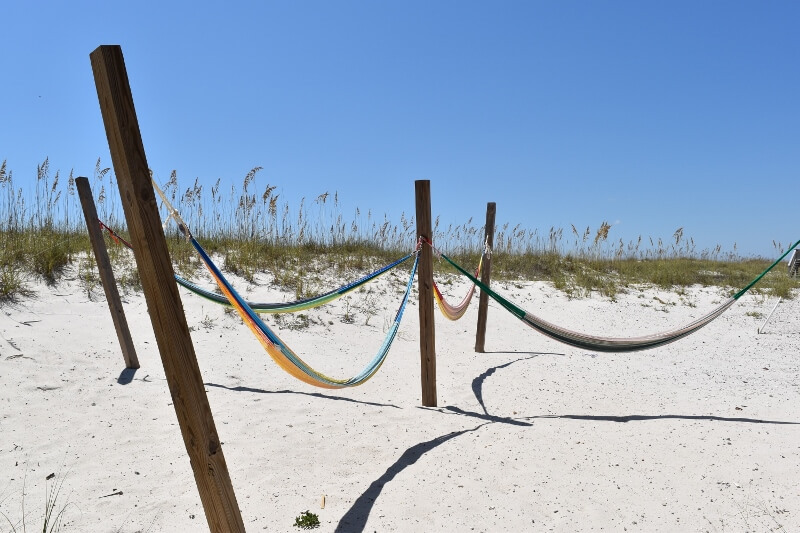 Loved the hammocks next to the house and the four at the end of the boardwalk on the beach. Great entertainment system music where ever you wanted it. Pool and beach were so relaxing and fun! Only one issue was the Internet was unreliable so made certain tasks a challenge. Whole family enjoyed thanks for the great memories! Morning Call - The Best! Morning Call was absolutely wonderful!!!!!!! The home is beautiful and there is nothing I would change. Thank you. Our entire group thoroughly enjoyed Morning Call and the beautiful beaches of Gulf Shores! We would highly recommend staying in this amazing house. It had everything that we needed to feel at home. It had plenty of luxurious space for all 6 families. and no major issues! The house is beautiful and exactly what the pictures show! Our large group had a fantastic stay here. The house was very clean when we arrived and has a very good layout and all of the necessary amenities. Check-in was a breeze. No complaints here. Morning Call is everything you want in a rental. That is if you want a huge, beautifully decorated, nicely supplied house. It is simply awesome. We had a wonderful time despite the bad weather and alcohol on the beach rule. We love this property and would recommend it to anyone with a large family. It was great again this year. We have been having our family beach vacation at Gulf Shores for 20+ years. This is the second year at Morning Call and it was another great year. We had 27 at this year and all enjoyed the house. It is perfect for our family in that it permits "grouping in the common area" but provides the individual rooms and baths for any private/resting time anyone needs. 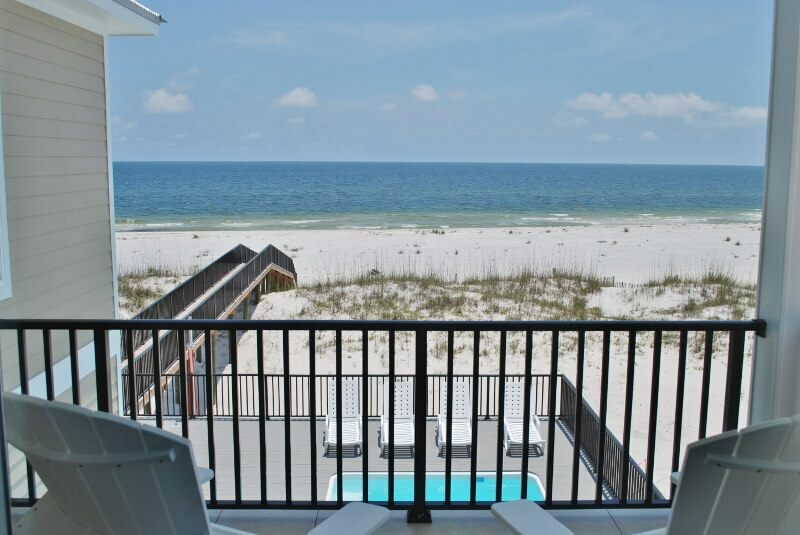 Gulf Shores has lots of activities for adults and children which provides more than enough for each member of our family. We have scheduled for next year and look forward to it. And, Geoff and Susan were very attentive and checked several times during our stay to insure all was well. Very beautiful venue for family gathering. Enjoyed it very much. A couple of suggestions: A stool for the bedroom for short people (me). We had to buy a stool so I could get in bed. A couple of the TVs only got one channel. Having to wash towels and fold them before leaving at 10 am, was off putting. (After paying what we did for the venue and cleanup fee.) Since we cooked for 20 people, more than 2 rolls of paper towels would have been helpful as well as some dishwashing detergent. We purchased these items and took home what we purchased. As I say please take these as constructive suggestions. We enjoyed the beautiful venue and the weather. We sometimes forget that guests don't always read the information we send! We definitely ask that guests please get the towels started and we are thrilled if the first load is in the dryer and a second load washing. 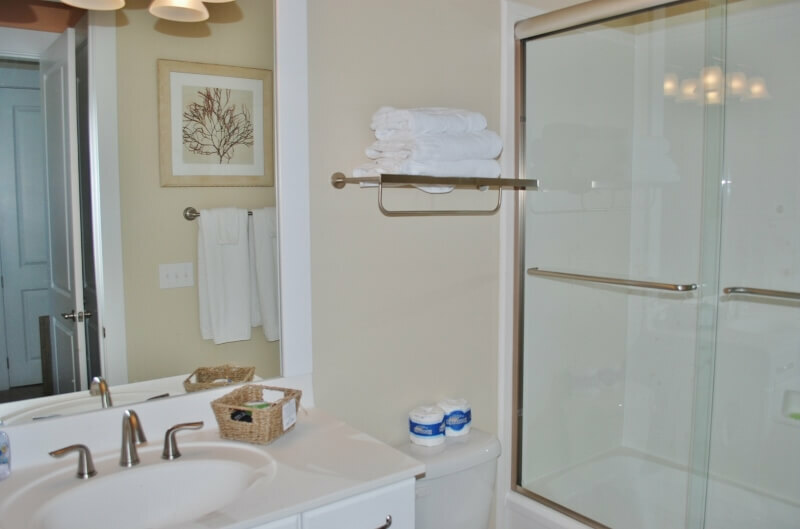 This keeps people from leaving wet towels on the carpets and beds, and also means they find many items that are otherwise left behind under the wet towels in bathrooms. 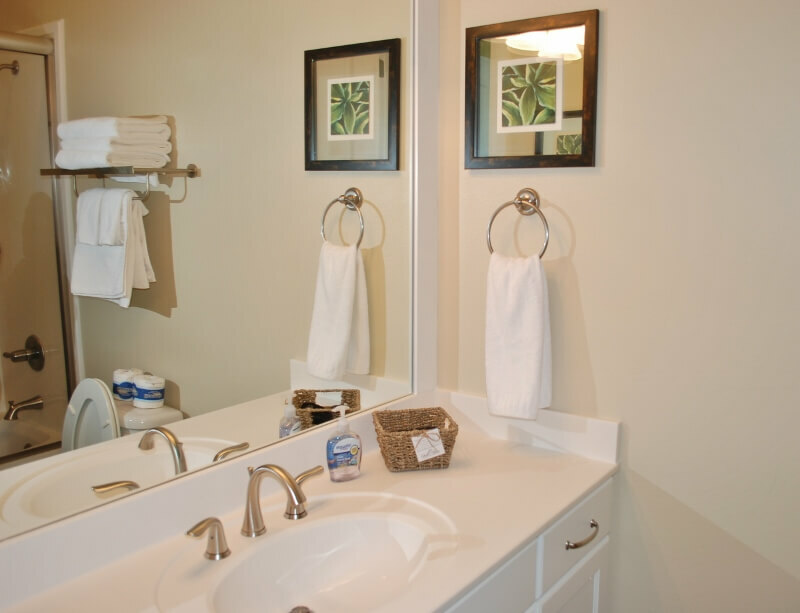 We provide a couple rolls of paper towels and a couple rolls per bathroom of toilet paper--enough to get you started. There should have been plenty of laundry detergent and dishwashing detergent for even a long stay at Morning Call. We apologize if we missed replacing the bottle of dishwashing detergent. Please call us about items like the TVs. They were on the incorrect input--they are all smart TVs with many channels plus Netflix. Twenty-eight members of my family enjoyed the house over Christmas. Best experience ever when renting a place on the beach! Our women's ministry brought a group of women to Morning Call for a retreat and we had a wonderful time. The house was absolutely beautiful, designed for large groups. The service from Susan and Geoff Gaberino was excellent. They immediately returned our calls or text and handled everything very professionally. We didn't have any maintenance problems or concerns during our stay. Everything worked wonderfully. We couldn't have ask for a better experience. Praying we will be able to hold another retreat at the Morning Call in the near future. There were a total of 25 of us staying in the house. It is a beautifully maintained house with great customer service. We were just a few minutes drive into the heart of town, but it's far enough that we could get the privacy we were wanting. Everything was perfect ... including the weather! This is one vacation that my family and I will never forget. Everyone was so excited when they arrived. The huge kitchen and living area was great for our party of 25. We had plenty of room for everyone. We had the beach and also a private pool at our back door. The game room was also a big hit for our kids. I would highly recommend this home to anyone. Three families spent a full week at Morning Call during Spring Break 2016. 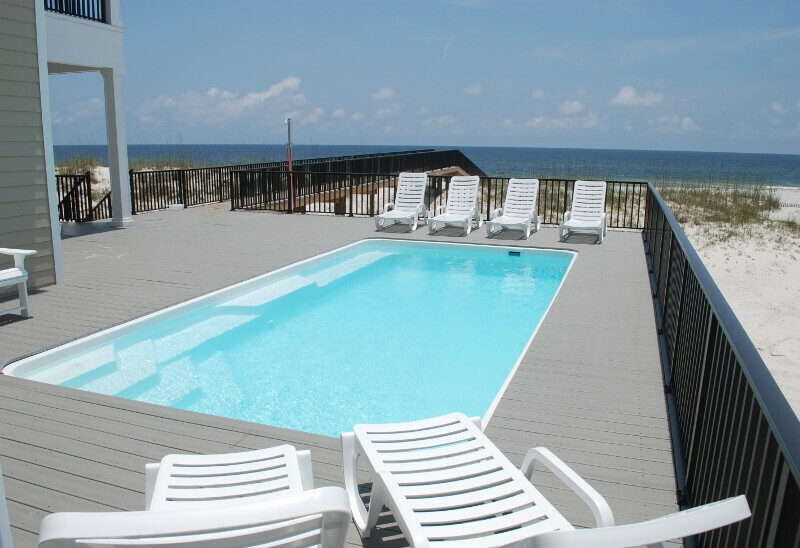 The house was wonderful with great amenities and great access to the beach. Susan and Geoff with GS Vacation Rentals were excellent hosts and very responsive. Would highly recommend Morning Call and GS Vacation Rentals. Outstanding experience in every way. 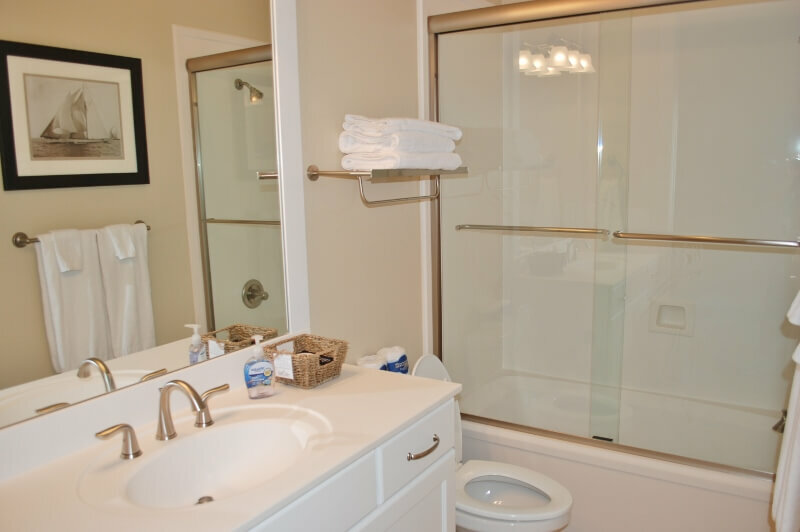 The house was spotless and perfect and easily accommodated our group of 21. GSVR was excellent and provided the best rental experience I've ever had. House was great! Everything clean. Lots of parking. Everything in the kitchen from crockpots to stockpots for cooking for our big group.